Every Sunday, I get out of bed earlier than the mister (teacher schedules are hard to break, even on the weekend!) and pad across the hallway, in my slippers, into the kitchen. I delight in these morning hours, using the time to read cookbooks, write, and experiment in the kitchen. When I found a recipe for applesauce in one of the best slow cooker books I’ve come across thus far, I thought, now why didn’t I think of that? Ever since then, like clockwork, I buy twelve apples on Saturday, and wake up Sunday to begin my new weekly ritual. Step one: I always daydream, if only briefly, about having an apple peeler–you know, one of those that winds the apple around a little metal loop, sending ribbons of peel into neat little piles on the cutting board. I don’t have one, but the truth is, I like the process of peeling around the stem while turning each apple in my hand, and the satisfying chk chk of the peeler. Being the band geek and music teacher that I am, I get a cheap thrill out of the rhythmic thwaps of multicolored apple pieces flying all over my butcher block all disorganized and random, some faced up, some down. Now, if you’ve ever read a Cook’s Illustrated recipe, you know that they are obsessed with repetition and variation–trying every possibility, even the slightly ridiculous, to eventually arrive at “the” recipe. For the past four weekends , I’ve been making like a CI test kitchen. There have been Granny Smiths, Galas, Fujis and Honeycrisps, sprinkled with granulated sugar and raw sugar, cooked on high and on low, spiced with cinnamon only, and, most recently, (and deliciously might I add), mulling spices–both mixes of whole spices, and those in tea bags. 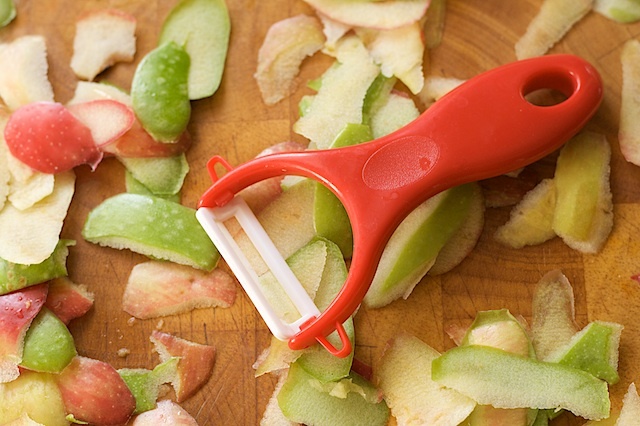 The process happens like this: Peel, core, and cut your apples into big chunks. Stick ‘em in the slow cooker. Toss with sugar, turn on the slow cooker (seems obvious, one would think), and do something else for 6-8 hours. No use adding the spices until the apples collapse and give you some liquid to nestle them into. Let the mulling spices steep for a while, then coax the apples into a sauce by smooshing and smoothing the apples against the side of the pot with a wooden spoon until you have your desired texture–I like mine with soft little chunks of apple remaining. Add more sugar and ground cinnamon, and you’re good to go! Ever so complicated, I know. There are still infinite possibilities to be tried, but my favorite variation (so far) tastes just like the applesauce that grandma always used to bring to Thanksgiving in a big pot (hi grandma! ), and tastes like a mug of mulled cider. I like it warm, just out of the slow cooker, or when cold, atop my favorite potato-apple latkes. I hereby pass my weekly ritual to you. Happy fall, and happy Thanksgiving! Mix the vinegar and one gallon cold water in a large bowl. Peel the apples and place them in the vinegar water as soon as they are peeled. Cut the apples in half lengthwise and scoop out the core with a melon baller. Put the cut apples back into the vinegar water until needed. 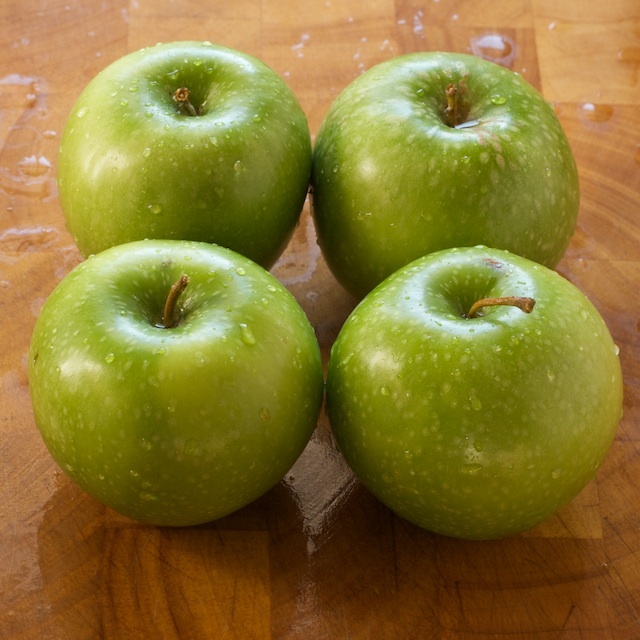 When finished coring, remove the apples from the water (discarding the water), cut into 1-to 2- inch chunks. 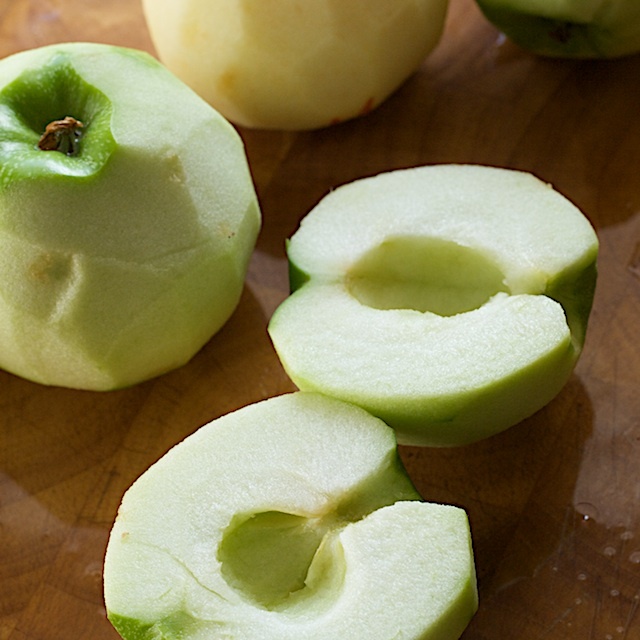 Toss the apples in the slow cooker with 2 tablespoons of sugar. Cover the cooker and cook the apples on low for 6-8 hours, or on high for 3-4 hours, or until the apples are completely tender. Stir the apples with a wooden spoon--they should immediately collapse and form a chunky sauce. Nestle the mulling spice satchel in the applesauce, cover, and cook for an additional hour. Remove the mulling spices, and smash and smoosh the apples against the inside of the pot until the sauce is your desired texture. Add cinnamon and additional sugar to taste. Rituals. Home-made applesauce every week. We need more of these in our lives. And more of your cooking! Rhythmic thwaps. Only from the mind of a musician…! Hi Jen, I finally got this made today. The house smells so good. I used Fujis and it tastes great! p.s. I was dreaming of having one of those cool apple peelers myself. Peeling doesn’t do much for me aesthetically, so I might need one. Ooh, glad you liked it Paula! Usually a water/acid soak is used to prevent browning. Applesauce typically includes cinnamon which inevitably turns the final product brown. This soak seems like an unnecessary step. Is there another reason for it?